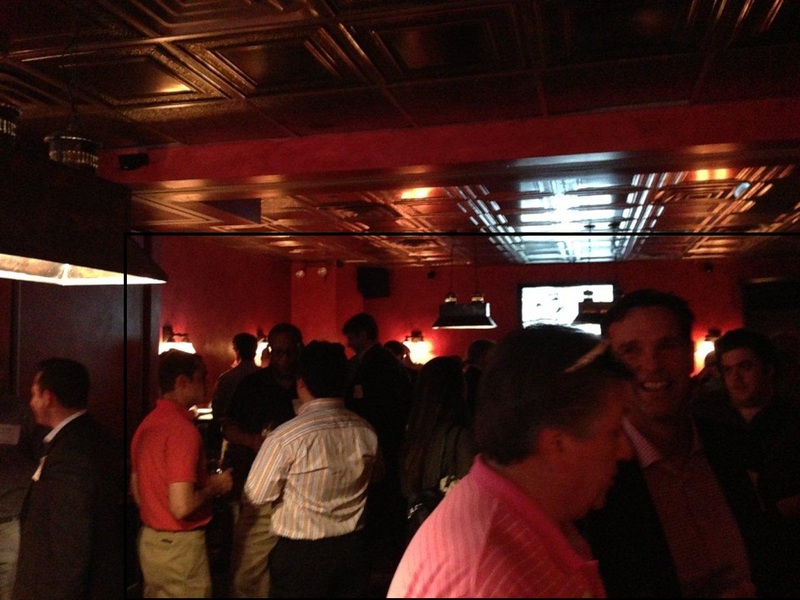 ►A large crowd of New York City area alums turned out for a Meet & Greet with Men’s Hockey Coach David Quinn, Women’s Hockey Coach Brian Durocher and other BU coaches at Stout NYC Wednesday night. Also on hand at the Manhattan watering hole—just two blocks from Madison Square Garden, where BU will meet Cornell for Red Hot Hockey IV on Nov. 30—were Jack Parker, Mike Eruzione and athletic director Mike Lynch. Photo: David Quinn (lower right) chats with Tony Ruvolo, manager of BU’s 1978 national championship team. Another Meet & Greet with the coaches is set for Tia’s in Boston next Wednesday evening, June 12. ►Three BU sophomores, forwards Danny O’Regan and Matt Lane, and defenseman Matt Grzelcyk, have been invited to USA Hockey’s evaluation camp for the 2014 U.S. Junior National Team. Grzelcyk attended last summer’s camp and was the last player cut from the roster prior to the WJC tournament in Russia. He and O’Regan, who led all Hockey East freshmen in scoring in league games, were named to the conference All-Rookie team last season. All three have previously represented the United States in international play, as members of the 2012 gold-medal winning World U18 Championships team. Lane and Grzelcyk both played two seasons with the NTDP program in Ann Arbor. ►BU’s third game of 2013-2014 is a home tilt with Rensselaer on October 18. The Engineers’ fan blog—Without A Peer—offers an early preview of the Terriers. If you haven’t noticed, The Terrier Hockey Fan Blog is now on Twitter and we’ve added a Twitter box to the sidebar. This will allow us to bring you Terrier hockey news on a more timely basis, presenting the topline information even before a detailed blogpost is added. New England Hockey Journal spoke with 2016 recruit Cam Askew about his commitment to BU and his 2013-14 plans which will take the Cushing Academy standout to the Indiana Ice of the USHL. The 6-2 forward from South Boston scored 35 points in 29 games helping to lead the Penguins to the New England Prep large school championship. One of the goalies that Askew will face next season is future BU teammate Shane Starrett, a 2014 recruit, who will be suiting up for Sioux Falls next season. Reporting on the Stampede's recent tryout camp, SB Nation's Chris Dilks noted that Starrett is the front-runner for the Sioux Falls starting job and that the 6'5" netminder "has some amazing quickness for a player his size." Starrett had also drawn interest from several BCHL teams, including the Powell River Kings, which was Terrier netminder Sean Maguire's junior team. Jillian Kirchner, a forward who scored 32 points for BU’s 2010-11 squad that reached the national championship game, has been named an assistant coach at Brown University. The Illinois native spent last season as an assistant at Division 3 St. Norbert’s in Wisconsin.